Corner lot 3 bed 2 bath home in Palm Harbor! 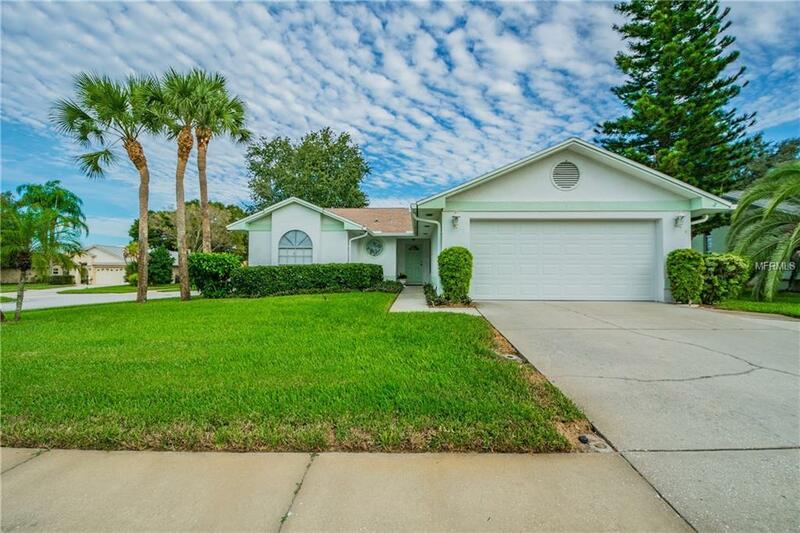 This Floridian gem has a striking front lawn with mature landscaping & palm trees plus a vinyl fenced backyard with pool & screen enclosure. Step inside to the living room to find high ceilings & a double sided fireplace going through to the family room. An adjoining dining room connects with the kitchen which has granite counters, access to the garage, breakfast nook & lots of windows for natural light. Across from the kitchen is the family room with ceramic tile flooring and sliding glass doors that open to the screened patio & pool with plenty of room to host all the best pool parties! Another set of glass sliders have entry to the master suite which features double closets & attached bath with dual sinks, soaking tub, & separate glass door shower. 2 other bedrooms both have carpeting & ceiling fans & share a hall bath with tub/shower combo. Updates include AC in 2014, vinyl fence in 2016, lanai ceiling & flat roof in 2017. The attached 2 car garage features a hurricane rated garage door & motor. Located close to shopping, dining, & the Innisbrook Golf & Spa Resort.